Following in the footsteps of Neon Chrome and JYDGE, 10ton’s trilogy of 80s inspired top-down shooters closes off as Time Recoil warps its way onto the Nintendo Switch. While the two previous titles leaned heavily on roguelike and RPG progression to drive the momentum forward, this little title keeps things simple by giving you little more to worry about than popping open a bunch of heads in slow motion. You play as Alexia, a woman who happens to be able to withstand the dangers of time travel without any side effects whatsoever. You become a part of a movement known as the Recoilers who are trying to take down a mad scientist turned evil dictator known as Mr Time. This crooked fellow has a stronghold on many countries due to his time-based weapon of mass destruction, and it’s up to you to try and manipulate a decade worth of history in an effort of securing a brighter future. As you can clearly see, Time Recoil isn’t going to win any awards on storytelling, but it gives you an excuse to go out and start murdering everyone for a good cause. Each mission is a short, quick blast affair that revolves around the player making a stylish combination of kills. Once you take out an enemy when aiming with the Right Stick, a bullet time effect takes place slowing down everything around you. The more enemies you massacre in a continuous flow, the stronger your ability becomes. Taking out three baddies, for example, will allow you to dash through walls while extending the body count further will widen your trajectory making for a more powerful method of attack. This leads to a series of events that resembles an R-rated action scene from The Matrix as you massacre a cluster of enemies like a more unforgiving fusion between John Wick and Neo – which is a dream come true for any Keanu Reeves fans out there. The whole ordeal begins to feel very satisfying as you plot out the most resourceful way to clear out a floor. You have to take into account your ammo and special abilities on how to use them to keep the kinetic energy flowing. This results in every one-hit death you receive becoming a learning experience until you create a pattern of blood splatter across each office block. The game itself has a heavy sense of Mr Shifty blended with Hotline Miami, just with less personality of the latter due to how graphically bland it all is. It’s obvious that all three of 10ton’s top-down shooters are milked from the same low-poly engine that was created in-house as they all seem very similar. While Neon Chrome and JYDGE look almost identical, the graphics in Time Recoil are a little less interesting although brightly coloured. The spectacle does fool you to an extent as it’s evident that the devs went for style over substance, which, for the most part, works quite well amidst all the chaos. It is just visually a bit plain, especially considering the story that they are going for. It really doesn’t matter what time frame you travel to because everything looks the same regardless of what year it is, with no references of any kind to give you any reason to even care. However, the game is clearer in Handheld mode in comparison to the vaseline blurriness of Neon Chrome and thanks to the slow-motion mechanic, the aiming feels much tighter also. Despite the core motive of killing more or less everything you clap your eyes on, there are smaller objectives in place. One level you are required to steal documents from early in the 80s, while in others you are sent to save some boffins taken as hostage. You’re even sent as far back as the 70s to murder a few evil boffins for working in alliance with Mr Time. Using keys or destroying motors will usually open locked doors to help with your objective, along with destructible walls that can be blown to bits with the thicker interior requiring a bit more boom from your abilities. Sometimes piercing a handy rack of gas canisters conveniently lined up against walls will also do the trick. The music lands on par with 10ton’s previous titles with the calls of synthesizers from 80s science fiction movies, blaring at full effect and fitting well with the gameplay. The gameplay itself, while far from original in both context and design is an overall fun experience that works perfectly for small portable time sinks due to how short the levels are. It certainly helps treat any urges to go postal in Primark while waiting for the other half to shop for Christmas. Time Recoil is a fun game that feels rewarding in triumph and moreish in failure. 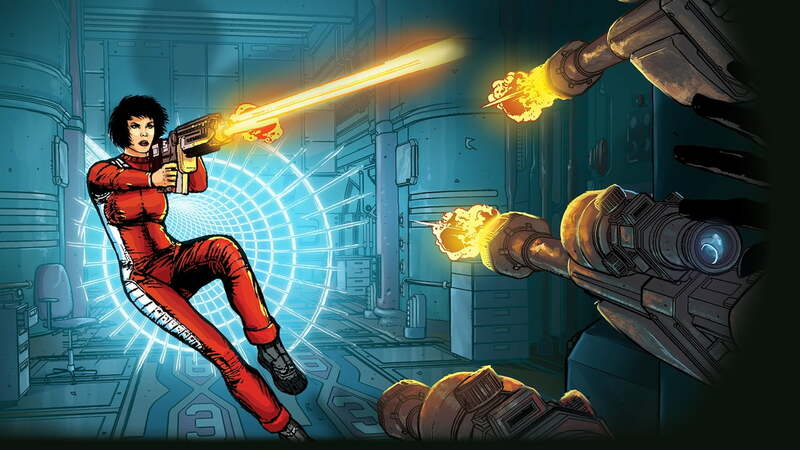 Sure, the graphics are rubbish and the plot seems written by an eight-year-old after a newfound discovery of 80s action films, but there is a fun and rather stylish shooter contained underneath its overall cheap presentation. There’s also an addictively difficult time attack mode to fine tune your rampage for those that want to truly feel like a badass. If you are a fan the other shooters from 10ton, or even Hotline Miami, then you will more than likely take to this. If you haven’t played any of the above, then Time Recoil is a pretty decent and simple time killer in short bursts.